The original two-storey “Bickford” residence was constructed in 1914. It was Brigadier General Harold Child Bickford’s home along with his family and 5 siblings. Ranelagh Park, as the estate was called, was a large property that extended to the Scarborough Bluffs. In 1921, the family moved to Buffalo, NY for real estate investments and polo. Between 1921 and 1923, the China Mission college, under the direction of Father JM Fraser, owned and operated the site as a boarding school for young missionaries bound for China. Although the building has numerous bedrooms, the mission quickly outgrew the premises. The property was sold to an American businessman, Richard Veech Look who owned “Cliff Acres” from 1923-1932. The story of the Guild Inn begins in 1932, at the height of the depression, when industrialization, technological advancement and societal values were in a rapid and tumultuous state of change. In 1932, Rosa Breithaupt Hewetson, a wealthy young business woman and widow purchased the property and married Herbert Spencer Clark, a man with similar social conscience and aspirations. The Clarks’ dream was to transform their grand summer home and estate on the Scarborough Bluffs into a self sufficient co-operative for artists and craftsmen. Their goal was to encourage the Canadian arts and crafts movement and to preserve traditional skills and methods of fabrication. Recognizing the importance of the arts in society, they formed “The Guild of All Arts”, an artist’s co-operative and centre for Canadian artists and craftsmen based on the American Roycroft community model. From 1932 to 1943, the Guild (Bickford) House became a residence for craftsmen and the Studio Building and the Bickford stables and garage accommodated their workshops. A few acres were planted with food crops and chickens and cows were kept to provide eggs and milk. By the mid 1930’s, people were coming in droves to the Guild to see the operation. In 1934, the west kitchen wing was expanded in order to provide meals for visitors. In 1937 the ground floor addition on the north side provided increased dining facilities as well as a gift shop. This was followed by further expansion of the wings and new dormer additions to provide additional guest rooms. By the early 1940’s the Guild had become a country inn set amid working artisans surrounded by magnificent grounds. Over the years, Rosa and Spencer acquired some 500 acres stretching from Kingston Road down to the lake and included one and a half miles of shoreline. During the early years of WWII, materials for some of the crafts, such as steel and iron for metalwork and specialty yarns for weaving became unavailable. In 1943 the house provided radio telegraphy training for WRENS, and later, a hospital for war veterans. The Guild of All Arts did not reopen until 1947. Following the war, the Guild could no longer afford to subsidize the artists. The Inn became used primarily for visitors and non-resident craftsmen. Property taxes increased dramatically and the Clarks were forced to sell 400 acres. Guildwood Village, the community surrounding the Inn, was the resulting development. 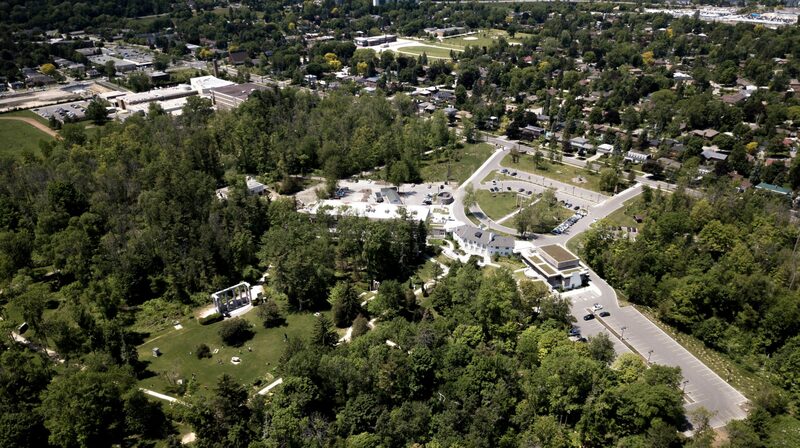 The area to the north of Guildwood Parkway was developed in the late 1950’s and the subdivisions to the west of the Guild Inn site followed in the early 1960’s. The post war years, particularly in the 1960’s, also brought a building boom and quest for modernization to downtown Toronto. Numerous heritage buildings in the City were being demolished to make way for new development. The Clarks noticed the loss of significant examples of craftsmanship and irreplaceable artistry. Spencer became involved with preserving Toronto’s architectural heritage. 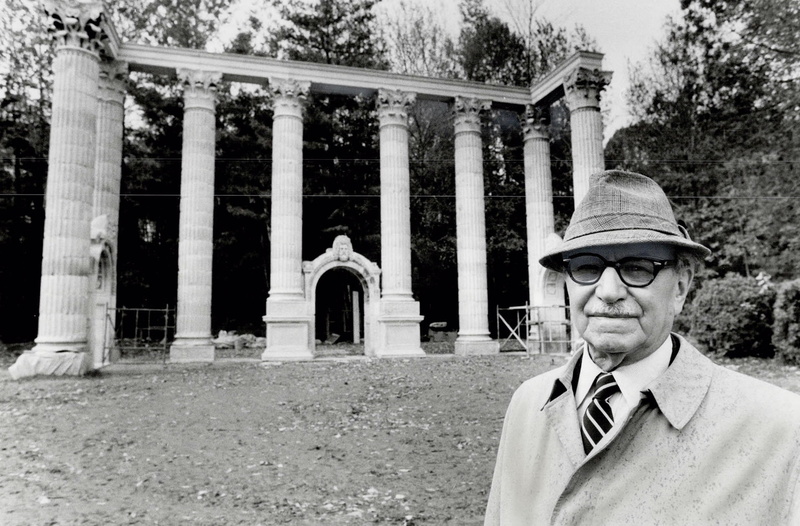 When threatened buildings were demolished, he saved architectural fragments and had them re-erected at the Guild Inn site. In 1965, a six storey concrete hotel wing was added, together with a swimming pool. Visitation to the Guild Inn increased. All kinds of visitors came, from dignitaries and ambassadors to movie stars and musicians. By the mid to late 1970’s, the Clarks were aging and in poor health. They felt a public trust in what this site could mean to future generations. Finally, in 1978, the Clarks convinced Metropolitan Toronto Council to acquire the site. After decades of disrepair, the City of Toronto entered into an agreement with Dynamic Hospitality & Entertainment Group. The brand new Guild Inn Estate opened in 2017 during the late spring as a wedding and special event space. The Scarborough Bluffs and Toronto community can once again build new fond memories through engagement parties, weddings, birthdays, anniversaries, celebrations of life and corporate events like product launches, fundraisers, gala, AGMs and more.